GaryMoller.com - Health, Fitness - Naturally! : Are athletes really getting faster due to legitimate training mehtods? Are athletes really getting faster due to legitimate training mehtods? I am not sure whether the letter above is an advertorial or a telling off - probably both. First of all, canoeing is several sports in one - it could be flat water sprints, slalom, canoe polo, marathon or as part of multisports. Each has differing requirements. The most important being a high skill base and then physical conditioning. I have a reasonable competitive canoeing background and have presented to kayaking coaches about the Lydiard Method of athlete conditioning. Canoeing is the only sport I have done competitively and never suffered an injury, other than being whacked under the nose by another kayaker's paddle! Ouch! I concentrated on long distance downriver racing and palying the waves so, other than sore shoulders and a numb arse, there are few other injuries because anything worse would probably result in terminal drowning. While I have no problem with gym conditioning for paddling, I will continue to argue that the best conditioning for most sports is to do the sport. Great athletes are not made in gyms - its time on the water, on the road and so on that produces them. Of course, they need to work to a structured coaching programme. In the case of canoeing, most, if not all of the strength work can be done on the water under the instruction of an experienced paddling coach who can devise sport-specific drills. If an athlete has the time and the energy to do fancy gym work, then he/she is probably not spending enough time on the water. I can not understand the logic of the argument that working out in the gym reduces injuries. 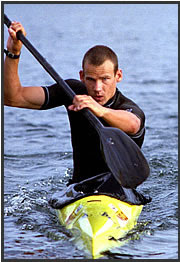 Injuries from kayak training are rare and where they occur, the problem is to do with poor techniques and training programme structure. Paddlers who get injured need a new coach and they might also benefit from a good shoulder massage, a better diet and more rest between training sessions. Who knows? Chucking weights is lower on the list of interventions. This is especially so, since weight training without meticulous practice carries much higher risk of injury than paddling a canoe! 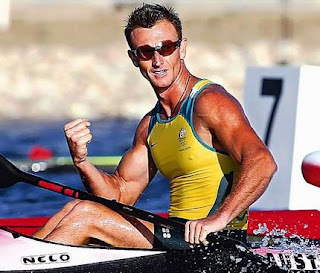 Photo: NZ Kayaker, Ben Fouhy, clean and mean and beaten by an Australian drugs cheat. Are athletes really getting that much faster and stronger due to legitimate means, or is much of what we witness today the result of outright cheating? In Lorraine's book, "On the Wings of Mercury" she tactfully talks about drugs cheats. In one story, she talks about "Catheter Woman" who creates a toilet queue under the Olympic stadium while she struggles to fit a plastic bladder and catheter with "clean" urine inside her before rushing out into the crowded stadium to make her winning attempt. Yep, Gold and the other atheltes knew what she was up to but could or would not say anything. An athlete does not accuse another of being a drugs cheat without the risk of having their arses sued to Kingdom-come, and of being totally unwelcome like a deformed leper for the rest of their living days by event promoters, their national sporting bodies and fellow athletes. Say "drug cheat" and your career is history. A drugs cheat gets only 4 years off - not a lifetime of ostracism as can happen to the clean athlete who speaks out. We should be under no illusions at all that drugs taking is not rife in sports across the board and we are naiive if we really think that the sports drugs testing agencies are getting on top of the problem. Clean athletes usually come 5th or less - seldom first. The next Olympics are being held in China. China is planning to dominate these games in the medal count. So, my question to you is this: How come we are not seeing Chinese athletes competing on the World stage right now? What are they getting up to behind the security of their national borders? well looking at a tv article the chinese are making young 8 year old girls run a marathon every day for training ! humanity goes out the window and sinks to new lows when egoes are involved in the quest for olympic medals.